We warmly welcome you to share "Our World". 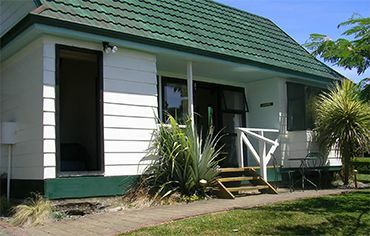 A relaxing and peaceful B&B with Kiwi "Homespun" Hospitality! A Giant 4.3m Fibreglass MOA Mascot also welcomes you. These Extinct Birds walked here until 1450 AD when NZ was known as Moaland! 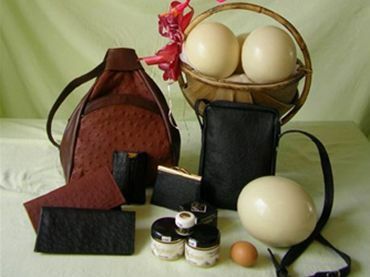 They belonged to the Ratite family which includes the Kiwi, Ostrich, Emu, Rhea and Cassowary. Their eggs were equivalent to 100 chicken eggs or 4 Ostrich eggs. 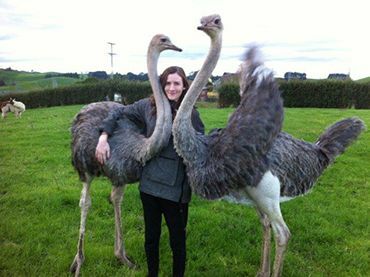 We have Ostrich, Emu, Giant Moa Mascot and 50+ Miniature Rare-Breed Animals plus cattle-grazing on 70 acres of green Picturesque Pastoral views. Much MOA than just a B&B!!!! 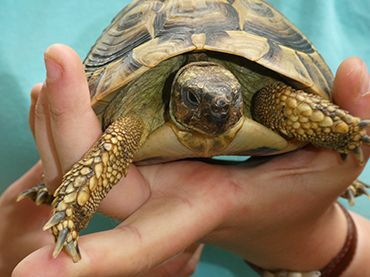 A "Pet Paradise" for animal-lovers, ideal introduction to animals for children being so friendly - they are our "outside family"! Ann and Ross Barnes are both 4th generation New Zealanders with 40+ years of tourism experience in the Waitomo area. Ross was a Park Ranger with Dept of Conservation for 20 years and built many local well-known walking tracks and has extensive knowledge of the region's history, culture, plants, birds and insects. Ross was a guide at the Waitomo Caves for 8 years and recently developed the Footwhistle Glow-worm Cave for Caveworld - an evening "MUST-SEE" for guests! See us for a 10% discount. Our guests are fascinated with the intrique of the Ostrich and Emu and the "Magical Moments" they enjoy with their cameras "Making Memories" with the Miniatures! Education and interest for adults and children alike. Common Comment: "So glad we found this place....our stay was the highlight of our trip - from the flirting of the Big Bird, to the magic of the mini-animals, then the awesome glow-worms at Footwhistle - my world is new!!" 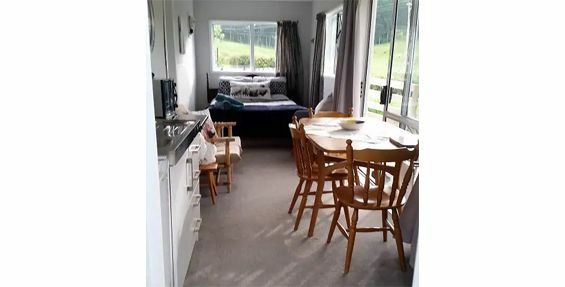 "Let us make your stay in Waitomo a unique and memorable experience." DRIVE IN and check us out. Affordable Rates including breakfast and Ostrich/Emu and mini-animal tour. 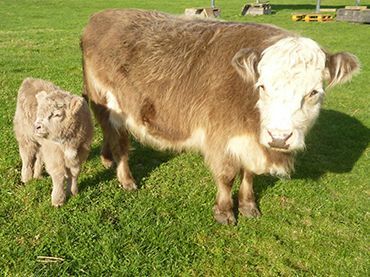 We are a "working farm", with animal tours - so we are always available on 0274-772707. Text your arrival time, so we can be there to greet you. I may be taking a tour when you arrive... relax and enjoy the faces at the fences!!! (homemade bread, homemade preserves/fruit, homemade yoghurt, juice, choice of 4 cereals including homemade muesli and spreads) + bacon and egg on toast. Hot Ostrich Omelette Breakfast $5 per person. Dinners by arrangement - $25pp Dessert $5 per person. 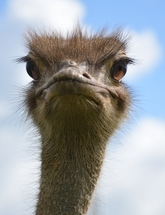 FREE: Ostrich/Emu and Miniature Rare-breed Animal tour... unlimited "animal-time for kids"! Adopt a pet for your stay - Pippy the gentle lovable Border Collie dog is a devoted companion to any available child or adult. FREE: Miniature Horse Rides (-30kg). 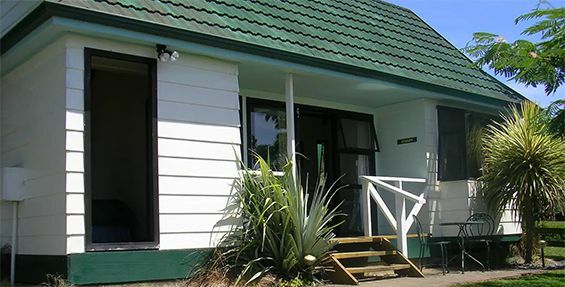 FREE: Information and Planning to get the best out of your stay in Waitomo. FREE: Pines Lookout Scenic Walk on the farm - 1/2 hr. 10% discount on www.caveworld.co.nz - Footwhistle Glow-worm Cave Tour. All linen, towels, kitchen utensils, heaters and Tea, Coffee, milk and sugar provided. Common Comments: My girls were in "heaven" with the animals." "The kids just loved the place!" 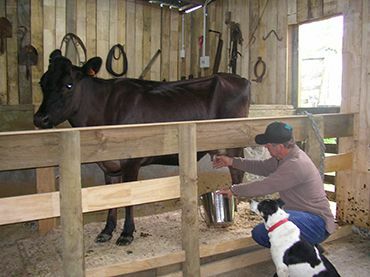 "A Truely Authentic farmstay... a real Home away from Home!" 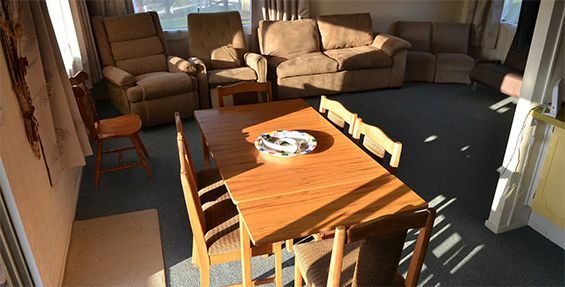 "New Zealand is a better place because of you....Thank-you"
"Loved the homemade bread and Ostrich Omelette"
Newly upgraded facilities with Wifi at the homestead, Flatscreen TV and new ensuites. Comfortable beds, great showers, kitchen and laundry facilities available. All linen provided. Great views and "moving pictures" out every window! Heaters in all rooms. Electric blankets on beds. sleeps 2-4 double bedroom + sgl + King Single in lounge. 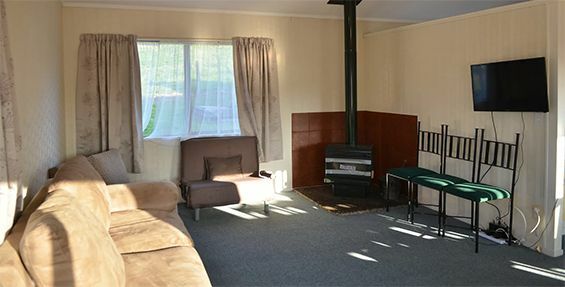 Sleeps 4-7 - Queen in Lounge, 4 singles in large bedroom (2 Beds can join to make king) Also 3/4 sofa-bed in lounge. "Child-minding/babysitting" available while parents enjoy Adventure Activities - Blackwater Rafting etc. Common Comment: Probably the best night’s sleep we have had on our trip". Sleeps up to 10 people. 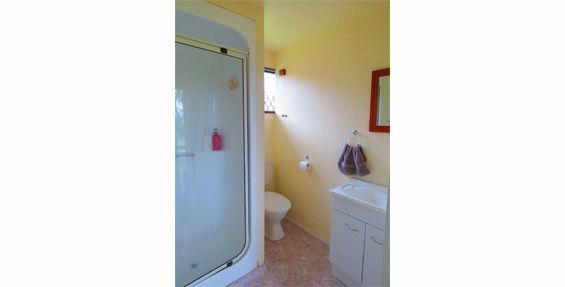 2 Bathrooms, 3 bedrooms, large lounge/dining/kitchen and deck area. BBQ area and spacious gardens. Garage and animals in adjoining paddock. We have just purchased this property and took over 15th Dec, so will update inside pics when we have painted and redecorated. Lovely spot - 2min walk to HuHu Cafe (best in the area) and 5 min walk General Store and 10min walk to the Glow-worm Cave. 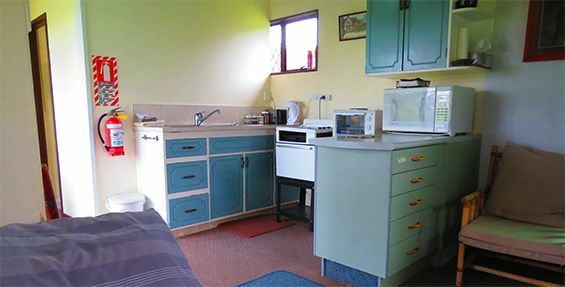 Facilities: Dishwasher, Fridge/Freezer, Microwave, Stove, Magtag Washing Machine, Drier, BBQ, Kitchen utensils for 10 people. Newly installed large heat-pump/airconditioner 2 Heaters and 2 Fans. Suited to longer stay than overnight! 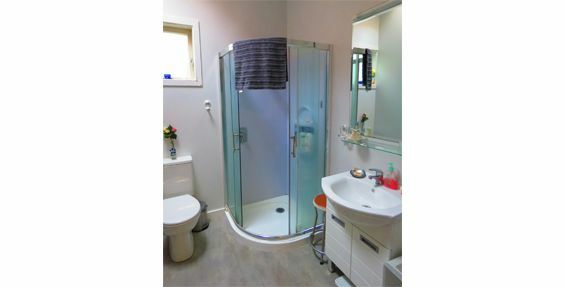 Super-safe, super private and Awesome Location! Check AirBnB for availability.....book by phone, e-mail or AirBnB. AirBnB incurs extra charges and cleaning fee.